Pittsburgh Pirates' Gift Ngoepe, a native of South Africa, celebrates his first hit. Gift Ngoepe of South Africa spent almost nine years playing baseball in the United States. He was in the minor leagues, the professional level below Major League Baseball. He started his career when he was 18. He is now 27 years old. He played for teams that are part of the Pittsburgh Pirates baseball organization, in cities like Bradenton, Florida; State College, Pennsylvania; and Indianapolis, Indiana. 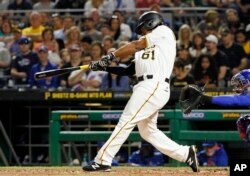 He played over 700 games before finally getting promoted to the Pirates on Wednesday. When he entered the game against the defending World Series Champion Chicago Cubs in Pittsburgh on Wednesday night, he made history as the first African player in the Major Leagues. And then he did something even more special: he got a hit in his first at-bat against Jon Lester, one of the best pitchers in baseball. As it rolled into center field, Ngoepe rounded first base and clapped his hands. His teammates smiled and cheered. The game stopped and the ball was taken out of play in honor of his first hit. “Awesome stuff, remarkable stuff,” the other announcer said. Ngoepe gets his first hit in his first Major League game. Ngoepe is from Pietersburg, near Johannesburg. He said he hoped his appearance in the Major Leagues would inspire more Africans to consider playing baseball. He started playing because his mother worked for a baseball team in Randburg. Dan Friedell wrote this story for Learning English based on reporting by the Associated Press, VOA News and MLB.com. Hai Do was the editor. How do you feel about Ngoepe reaching the Major Leagues? We want to know. Write to us in the Comments Section or on our Facebook page.